The Incredible Health Benefits of Eating Chillies. The Health benefits of eating chillies are well documented but surprisingly little known, despite the many numerous and profound ways in which they are known to aid, relieve and prevent many conditions. The main component in chillies is a chemical called Capsaicin, which is responsible for the intense heat felt. But what else does Capsaicin do? Eating chillies can have a very positive impact on people that are overweight or suffer from diabetes, say a team of researchers at The University of Tasmania, whose research was published published in the American Journal of Clinical Nutrition, in July 2006. The study carried out yielded that the normal eating of chillies can help significantly control insulin levels after eating a meal. The actual data they collected was able to show that after eating Chillies, the amount of insulin needed to lower the body’s blood sugar level following a meal was reduced by a staggering 60%. The exact way in which Chillies act to reduce the need of insulin by this amount is not fully understood yet, but it certainly spells good news for people who have diabetes, as the effects produced by consuming a low amount of Chilli are easy to achieve in everyday cooking. Often overlooked as circulation boosters, chillies can have a dramatic impact on your health by helping to boost circulation and also act as a thinner to help protect against strokes. Eating food with chillies every day is all you need to do to enjoy the multiple and important health benefits they have to offer. While you are reading this article, we would also like to point you to a link which we hope can be shared in order to spread awareness of the symptoms and warning signs of a stroke. A neurologist says that if you identify the symptoms and diagnose a stroke and treat within 3 hours, the effects can be completely reversed. A cardiologist says if everyone who gets this e-mail sends it to 10 people; you can bet that at least one life will be saved. Here is the article: How to easily identify a stroke. Capsaicin is well known to contain a Neuropeptide associated with the inflammatory process. Chilli related alterations in plasma proteins have been reported in patients with auto-inflammatory diseases such as rheumatoid and arthritis. The regular intake of chillies can help to minimise the effects these diseases have on the body. Capsaicin has also been found to provide effective pain relief without the numbing effect usually associated with anaesthetics, and the inability in some cases, to operate machinery, along with the usual sedative effects some Painkillers cause. Researchers at Havard University recently announced that they believe Capsaicin can be used to target pain receptors, without affecting nerve cells and causing the side effects mentioned above, which is a big plus. Real world uses for the compound might include: treating pain caused by Child Birth, providing effective pain relief during Dental Procedures without the side effects of numbness all day, enabling the patient to carry on with their daily tasks straight away, without delay. Many Painkillers currently in use today affect mental alertness, and the ability of a patient to function properly while the drugs are being administered. Capsaicin could provide a safe alternative to the unpleasant and inconvenient side effects associated with other Painkillers. 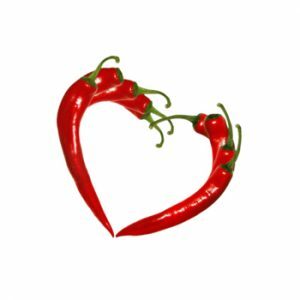 Many studies now reveal that Chillies can have a Therapeutic effect on the body, allowing one to relax more easily. Capsaicin blocks a natural chemical called Substance P, which is involved in the transmission and perception of pain. As a result Chillies can be useful in relieving and preventing common problems such as headaches, migraines and discomfort caused by sinus problems, allowing a person to relax more easily. Chillies are great at quickly and effectively opening your nasal passages, allowing you to breathe more easily, although this is probably a side effect of preparing you for the panting following a particularly hot one! Cancer Reasearch published a study in March 2006 which concluded that Capsaicin helped stop the spread of prostate cancer. The Capsaicin found in Chillies triggered suicide in both primary types of prostate cancer cell lines. “It also dramatically slowed the development of prostate tumors formed by those human cell lines grown in mouse models” said Soeren Lehmann, M.D., Ph.D., visiting scientist at the Cedars-Sinai Medical Center and the UCLA School of Medicine. The dosage on mice that produced these effects equated roughly to about 5 Habanero Peppers a week for an average adult man. Chillies and Stomach Cancer have long been a topic of debate amongst researchers, with many varying opinions. Researchers at The Yale University of Medicine concluded in 1994 that Chilli Pepper consumption may cause increased risk of stomach cancer. Compared to nonconsumers of Chili Peppers, consumers had an increased risk of stomach cancer (odds ratio 5.49; 95%). Among consumers, there was a highly significant trend of increasing risk with increasing self-rated level of Chilli Pepper consumption (high, medium, or low). That said, the study found that “definite conclusion is not warranted” because there was no assesment of dose relationship. Another recent study by The Mexico National Institute of Public Health found higher rates of gastric cancer in people with high Chilli intake (9-25 Jalapenos a day!). However no clinical evidence was found that it was the Chillies that were causing the increase in cancer. However, A Berkley neurobiology study found the opposite to be true. They concluded that Capsaicin/Chilli consumption to be “protective against stomach cancer”. They pointed to the fact that the gastric cancer rates in Mexico, where Chilli Pepper consumption is particularly high, are relatively low. They also noted the correlation between increased Chilli consumption in the USA and falling rates of gastric cancer. The incidence of stomach and colon cancer is far lower in South America, where they eat far more Chilli than they do in the North. Scientists have also found that Capsaicin inhibits cancer cell growth. It is probably fair to say, in conclusion, that any problems associated with eating Chillies, were found in cases where the intake was so high as to be excessive, and as we all know, too much of anything can be bad for you. The health benefits of eating Chillies are clear and proven, and we hope to have evaluated the potential of eating Chillies in a way that will help highlight many of the great rewards of eating these little balls of fire! All you need to do is start cooking and enjoying the fantastic tastes you can create with chillies and why not get all these benefits and entertain your guests at the same time by growing Chilli Willies! View our Chilli Growing Kits and get started growing your own naughty looking chillies today! If you found this article helpful, please share this page with your friends and family on Facebook, Twitter or your website – your support is much appreciated and will allow us to both develop more content, and reach more people with this valuable information. You may also want to read our article on spicing up elderly health and nutrition with chilli peppers.